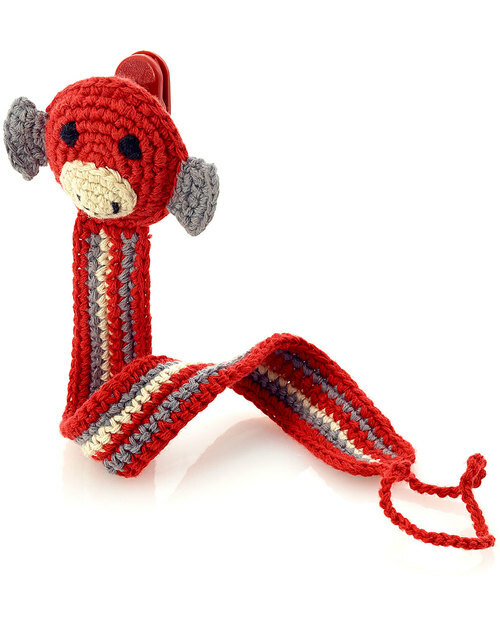 This is a rather special monkey friend with a cheery smile and lots of character, and he’s made entirely out of crocheted cotton! 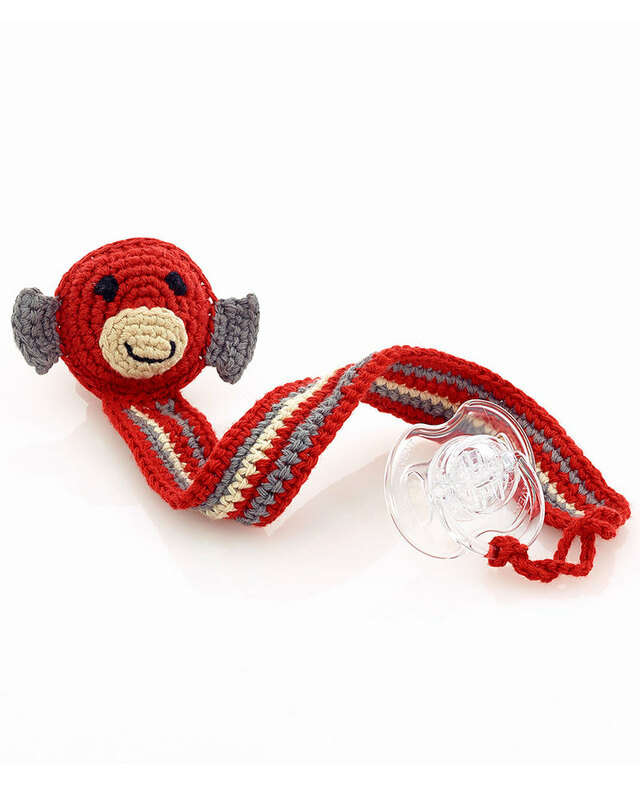 Part of a new line for Pebble, this handy clip keeps hold of your little one's pacifier, stopping you losing endless dummies or finding them dirtied on the floor. Simply attach to the loop and then clip the strap to your child's clothing: it really is as easy as that! A sweet gift featuring a favourite Pebble character, it is entirely by hand by skilled workers in a women’s craft cooperative in Bangladesh. The materials used are pure cotton for the outer layer, whereas the interior is polyester. A lovely bright product that is also completely safe for your children to play with. Certified Oeko-tex 100, the strictest international standard for fabrics and colours that guarantees absolute safety. Machine washable at 40 degrees; tumble dry on a low setting. 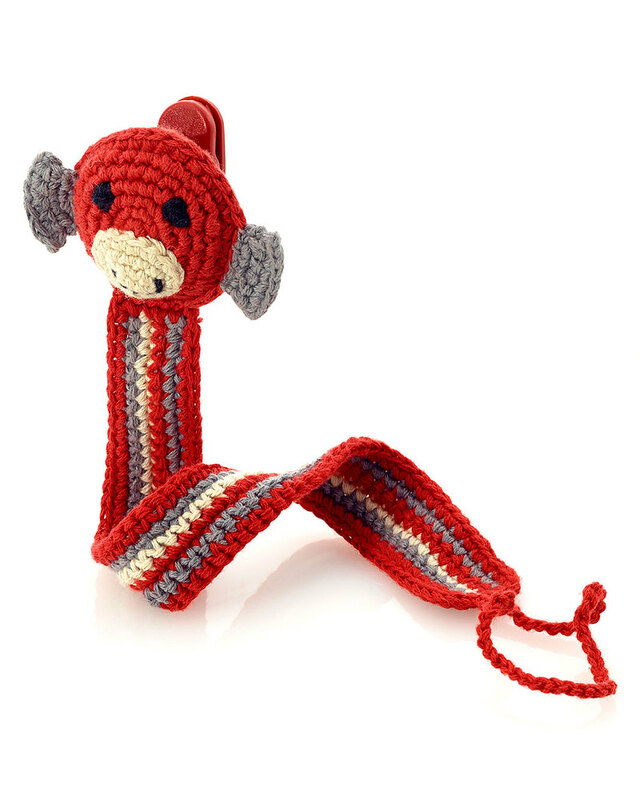 We’re sure you’ll love Pebble’s quirky animals and colourful toys. 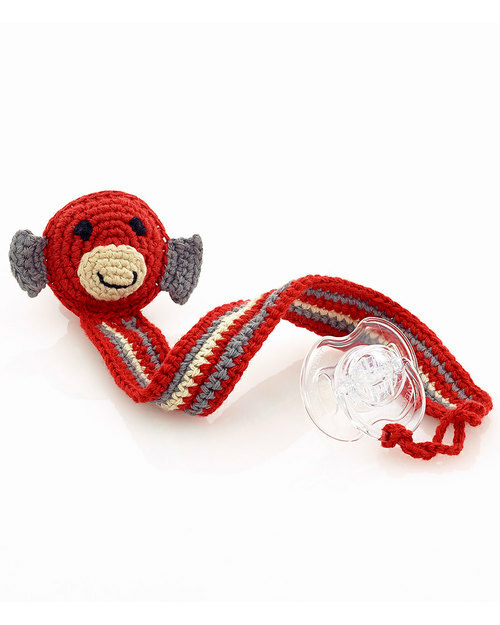 Our wonderful knitted & crochet toys are hand-crafted with great care and skill by women in rural areas of Bangladesh. Rural jobs that are fairly paid, good quality, flexible and fair! Every purchase of Pebble gifts helps create employment opportunities for artisans that working close to their homes in a safe working environment. All Pebble products are made by Hathay Bunano. Hathay Bunano, meaning hand-made or hand-knitted in Bangla, is a non-profit fair trade organisation in Bangladesh. Family Nation is proud to be the distributor for Pebble for Italy!